That’s right; why not take an up-close-and-personal dip in great white shark-infested waters with White Shark Diving Company (WSDC), which specialises in underwater adventures that showcase the kings of the deep in their natural habitat? Dive into the wild, and toothy, side of life and swim with one of the Atlantic’s most majestic, and rather misunderstood, sea-creatures all from the comfort of inside a strong steel cage, of course. 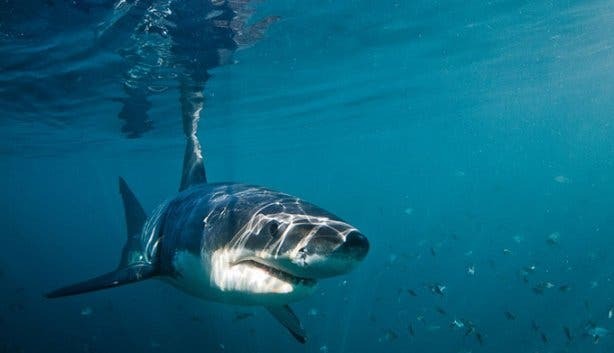 Operating from the quaint seaside town of Gansbaai – located approximately two-hours from Cape Town and best known as the ‘great white shark capital of the world’ – divers can arrange to be picked up in the Mother City or can meet the diving operator at Kleinbaai harbour in Gansbaai. 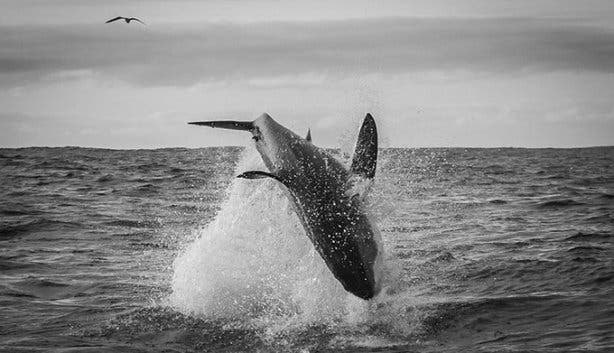 Whether you opt to drive yourself or be picked up by WSDC for the great Gansbaai-trek, the day starts at the crack of dawn – prime time for shark viewing – where all adventurers, thrill-seekers and everyone else in between are in for a sharky-treat as they come face-to-face with one of nature’s most enigmatic and powerful marine predators. But what is it exactly that gives this little coastal village such an appeal for these apex fish? “The fact that about 50 to 60 000 seals live just around the corner – providing many free meals for the sharks – might have something to do with it,” grins Nik Walsh, managing director of WSDC. 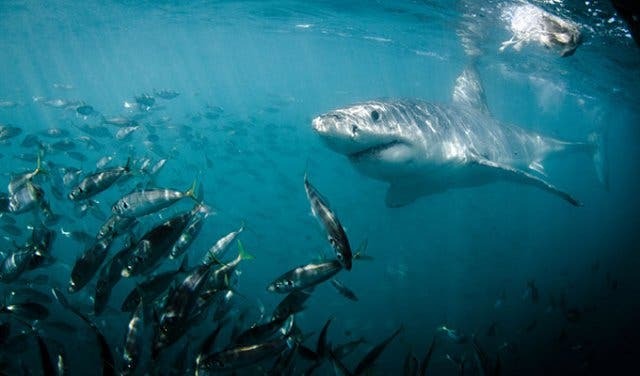 “Nowhere in the world is there a comparable natural food source available for the great white sharks,” he adds, further contributing to the allure of the bucket-list experience. The shark cage dive takes place at Dyer Island – a roughly 15-minute boat ride from the mainland. WSDC’s boat, White Shark, is a 12-metre custom-designed sea-cabin cruiser catamaran built to the exact specifications required in the shark cage diving industry ensuring a passenger’s utmost safety and well-being at all times. The most recently built vessel in the field, with one of the most modern designs and requirements installed, WSDC aims to provide divers with a more private and exclusive experience than anyone else in the shark cage diving biz. 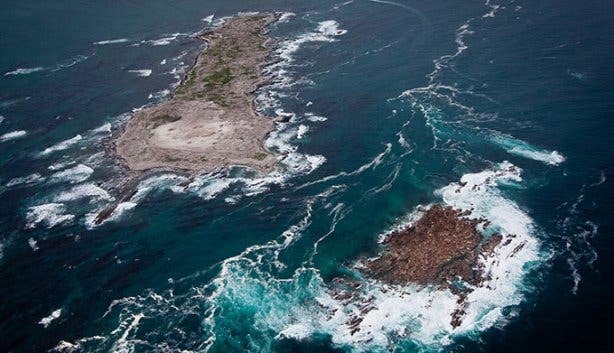 As mentioned, Dyer Island is home to a colony of 50 000-plus Cape Fur Seals, the great white shark’s preferred and primary source of nutrition, thus serving as the ideal location to spot the toothy (and hungry) sea creatures. Running between the isle and neighbouring Geyser Rock runs a channel of ocean; owing to the frequency of great white sharks in this strip – this waterway is commonly used by seals as a breeding ground enticing the sharks to enter – the area has been aptly labelled ‘Shark Alley’ and is said to have the world’s largest year-round great white shark population. It’s near this diving site that WSDC drops anchor and lowers its eight-man floating cage into the big blue below preparing for the majestic apex predators to approach. 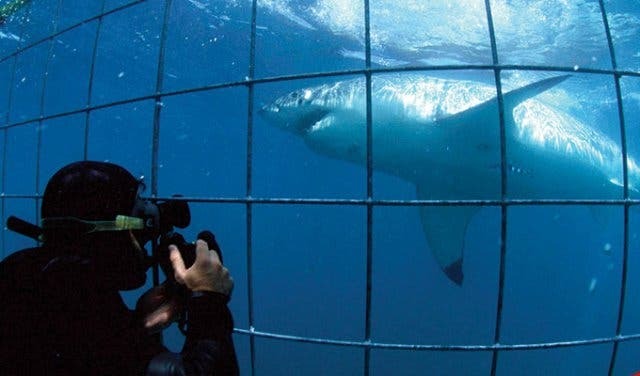 Although shark cage diving excursions take place throughout the year, sightings cannot be guaranteed and customers are encouraged to dive during South Africa’s winter months (from June to August) as the slightly warmer ocean as well as the influx of baby seals make for the perfect shark viewing conditions. What’s more, and in addition to the shark cage diving tours WSDC offers, the reputable Gansbaai-based experts also offers customers shark breaching trips – breaching is a hunting technique used by great white sharks where they propel their bodies out of the water to catch their prey unawares – during the winter months only. 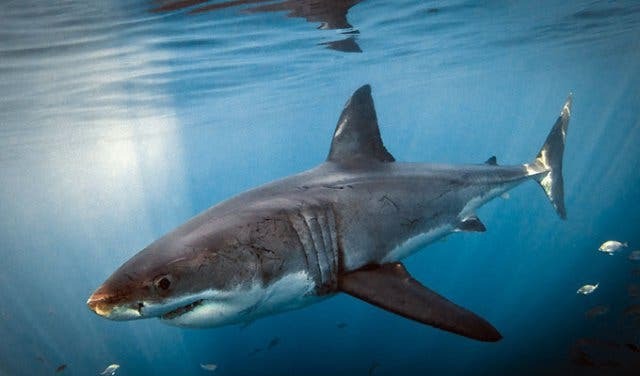 Many groups combine the two shark-sighting options starting their tour with a shark breaching trip showcasing how the powerful creatures hunt before cage diving with them for a more intimate and graceful encounter. 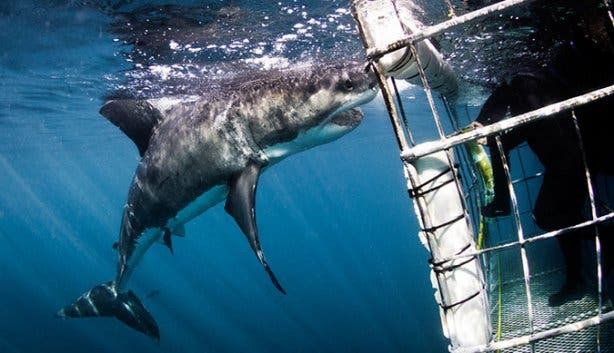 Although nothing beats the ‘real deal’ – a genuine up-close-and-personal swim with the great white sharks from within the cage – there is also the possibility to tag along for the boat ride without actually diving. 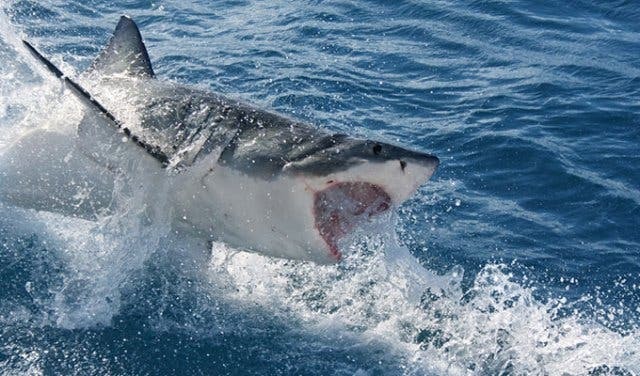 For those who opt to keep the great whites farther than arm’s length away, the upper deck of the boat offers a spectacular viewing spot as great white sharks are surface feeders so majority of the action takes place on or close to the water’s edge. Functioning as one of eight shark cage diving operators in the area, WSDC has been operating for over 20 years – with a 100% safety record – and for the last three years has received the TripAdvisor Certificate of Excellence, and takes pride in providing its customers with an exclusive and personalised diving experience. 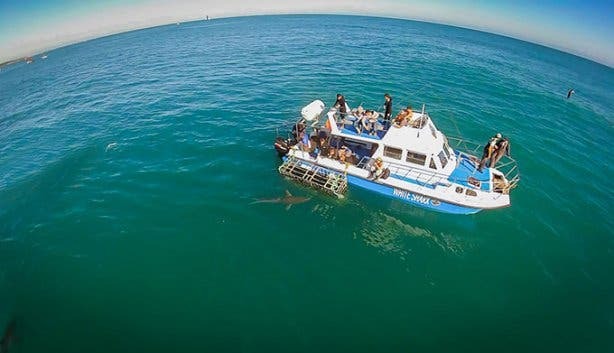 Limited to 22 passengers per a trip (with only eight divers allowed in the cage at once), WSDC ensures that each client receives ample shark cage viewing time as well as quality on-board spotting of the great white sharks and other sea life from the viewing deck of the vessel. WSDC truly offers all – adrenaline-junkies, marine-enthusiasts and more – an otherworldly opportunity to witness the majestic great white shark in its natural environment, revealing just how beautiful and elegant one of the ocean’s most feared predators actually is. Far more than just a diving company, WSDC is also deeply committed to conservation as well as the protection of great white sharks and is a founding member of the ‘Great White Protection Foundation’. Actively involved in several conservation and community upliftment initiatives, WSDC has been a leading voice in the call for operators to collaborate in protecting the dwindling number of sharks and other marine species off the South Africa’s coastlines, which are so crucial to the health of our oceans. With a key focus on educating local and international visitors about the plight of the great white shark and to raise awareness, WSDC runs daily informative trips for guests, presentations for local schools, as well as coastal clean-ups – all focusing on the unique and widely misunderstood sea-creatures and current conservation initiatives. 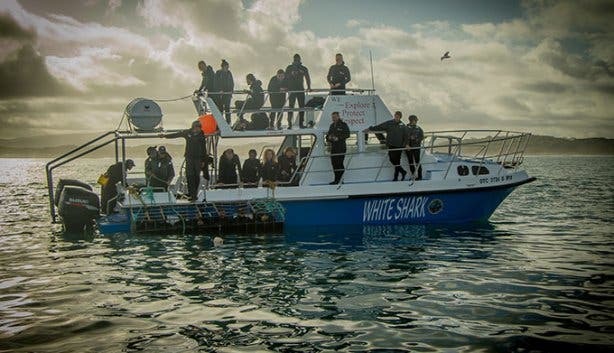 Operating as the only registered shark cage diving company in the country that is officially accredited by the GreenLine Responsible Tourism Rating Programme, this proves that WSDC manages their activities and tours with a sincere regard for social, economic and environmental impacts. Furthermore, committed to supporting and funding the conservation of other ocean species and the marine ecosystem in its entirety, WSDC supports the development of various projects and initiatives such as the Sharksafe Barrier (a sustainable and non-lethal innovative new technology to promote beachgoer safety and an alternative to detrimental shark nets and drumlines that have proven harmful to thousands of sharks, dolphin, turtles and other marine species every year along South Africa’s coastlines), as well research spearheaded by the University of Stellenbosch’s shark research group that focuses on ID photographs, dorsal fin identification and genetic analysis. These studies are crucial to understanding more about these mysterious sea creatures and the role that they play in the marine ecosystem in an attempt to improve understanding of overall ecological functioning in the area. These are just a few of the innovative and inspiring initiatives WSDC is involved in facilitating and funding. In an attempt to further develop their research and educational enterprises, WSDC has launched a Volunteer Programme for budding scientists, biologists and marine-enthusiasts. 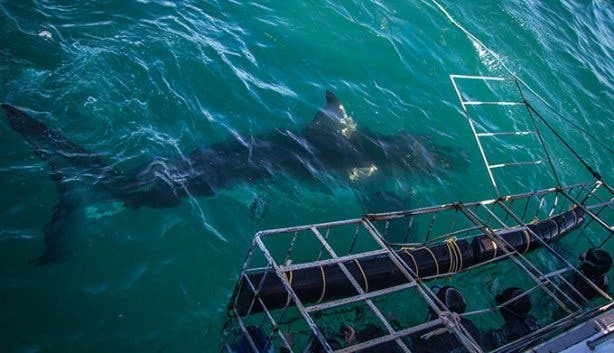 The programme offers volunteers the unique opportunity to view and study these incredible creatures as well as be involved in ground-breaking research studying white shark behaviour, shark and ray diversity and abundance, marine debris accumulation and ocean conservation in one of the world’s most fascinating and dynamic ecosystems. 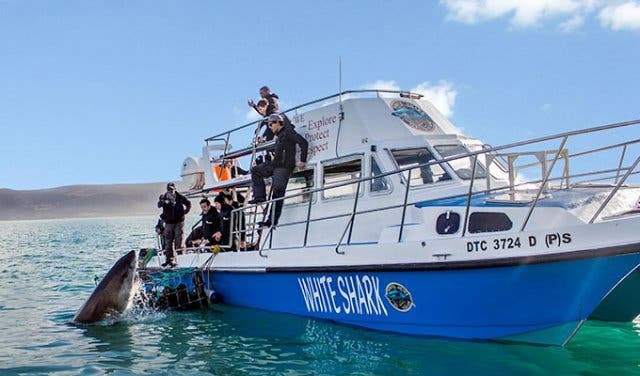 Volunteers will gain work experience on the WSDC tourist boat, cage dive with the great white sharks, review South Africa’s marine life as well as have the opportunity to get involved in exciting community and environment projects. 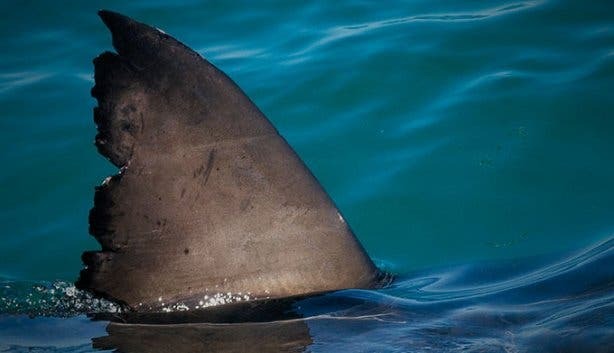 Through this, WSDC aims to assist the University of Stellenbosch’s shark research group with their innovative research by playing a vital role in data collection and management. Ultimately, WSDC aims to ensure the survival and wellbeing of great white sharks and the marine environment as a whole. By shark cage diving with WSDC, you too are helping to support and fund WSDC’s mission as well as the above ground-breaking marine conservation projects. Passionate and dedicated to what they do, WSDC strives to provide that once-in-a-lifetime educational experience for people to come face-to-face with the ultimate ocean predator, the great white shark and witness the true grace of the animal in its natural habitat, altering negative perceptions of the endangered species and in turn contributing to their conservation. 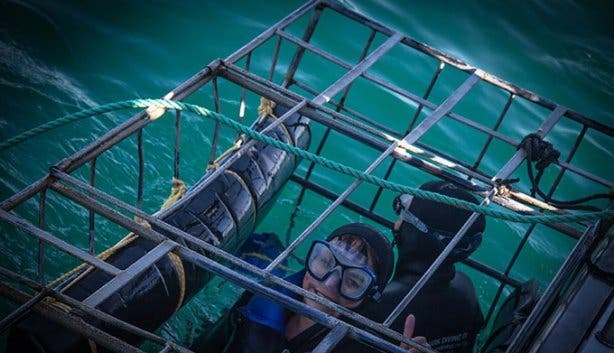 Great White Shark Cage Diving? Check! 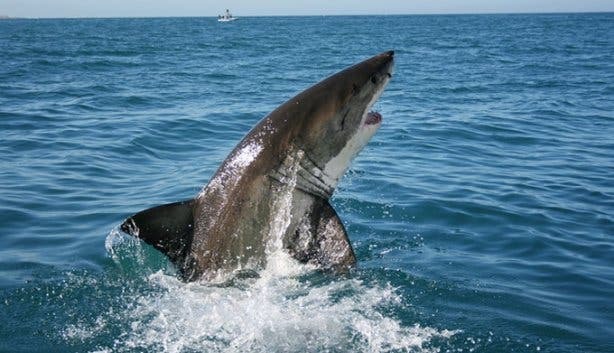 NOTE: For more information about White Shark Diving Company’s trips and tours, call +27 (0) 82 559 6858 or email info@sharkcagediving.co.za. Age Restrictions: Shark cage diving is suitable for children 12 years and above. WSDC does not recommend that children younger than 5 years join the trip. WSDC Volunteer Programme: For more information about WSDC’s Volunteer Programme, call +27 (0) 74 550 6654 or email at volunteer@sharkcagediving.co.za. Alternatively, visit WSDC’s website. Looking to tick something truly Capetonian off your bucket list? Try free diving, scuba or snorkelling with Cape fur seals and make use of our exclusive 25% off seal snorkelling special. Also check out these super unique scuba diving adventures with Ocean Experiences. 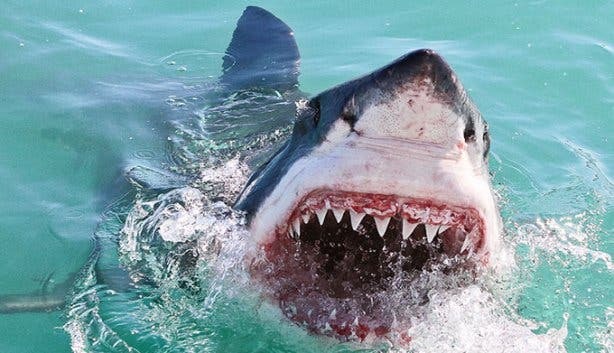 Before you embark on your once-in-a-lifetime Great White Shark cage diving experience in Gansbaai, make sure you buff up your ABCs – and stats and facts – about these fierce fish. 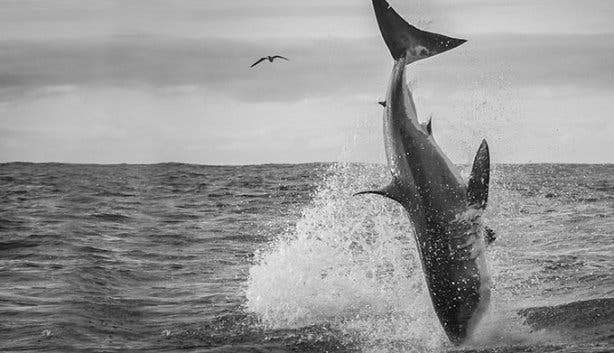 Also, read more here about White Shark Diving Company’s Breaching Tours.